Guests will get a big kick out of this little whiskey cask hand-made from American white oak. They'll be even more surprised when they see it's a real, functional whiskey barrel---complete with spigot and bung---and not just a decor piece. Like any oak barrel, it's also designed to properly age your chosen beverage, be it wine, beer, tequila, rum, or any other spirit. Want some fun? Roll out the barrel! Guests will get a big kick out of this little whiskey cask hand-made from American white oak. They'll be even more surprised when they see it's a real, functional whiskey barrel---complete with spigot and bung---and not just a decor piece. Like any oak barrel, it's also designed to properly age your chosen beverage, be it wine, beer, tequila, rum, or any other spirit. Holds 1, 2, or 5 liters. Reinforced with steel hoops. Sits on a wooden stand, included. Comes with care instructions and storing/sterilization tablet. 1, 2, and 5 liter Mini Oak Wine Barrels are sold separately. Personalize first line with name up to 16 characters, second line (under "WHISKEY")("Distillery" included) with full distillery name up to 24 characters and third line city and state up to 34 characters. 1-Liter Barrel, 6-1/2"L x 4-1/2"Dia. 2-Liter Barrel, 7-1/2"L x 5"Dia. 5-Liter Barrel, 9-1/2"L x 6-1/2"Dia. Note: When curing the barrel for the first time, leakage may occur. This is normal. Simply follow the instructions on sealing the barrel. Ordered this for my husband Last Christmas ( 2014) He just put whiskey in it a year later ( Dec 2015). The barrel started leaking instantly. Has anyone had this issue before? Is there something we should do to prep the barrel? BEST ANSWER: The wood needs to swell to seal the barrel completely. Either fill the barrel with water and let it swell/leak over a pan for a few days or submerge the whole barrel in a bucket of water. Submerging the barrel will give it a "weathered" look. Once swollen, it should be watertight. After filling it with alcohol, the barrel should be rotated occasionally or the wood staves on top with dry out, shrink slightly, and leak again. If the barrel dries out or is empty, the process will need to start again. My barrel came with directions. Yes! You need to prep/seal wood by adding water into before the whiskey and rotating the barrel over 24 hour period at least so that the water "seals" all the inside of the barrel. Hope this helps! If for the second line I enter "Smith Distillery", will the word "Distillery" show up twice since it indicates that it is included? Does it come with wine in it? BEST ANSWER: These are sold as empty display pieces, you will have to provide your own wine or whiskey for them. Can you put a bottle of whiskey and just drink that? BEST ANSWER: Yes you can, enjoy ! BEST ANSWER: The Personalized Mini Oak Whiskey Barrel has a light stain on the outside and is charred on the inside. No, the inside is charred like bourbon barrels used by high end distilleries. It has a light was coating on the outside. When I start my aging process, can I add vanilla extract, maple or other flavorings to my creation? BEST ANSWER: Hunter, yes absolutely! Infuse away! you can flavorings to your whisky or other liquor before adding to the barrel or in the middle of the aging process depending on how long you want to infuse. Only thing to keep in mind if adding spices is anything too large might clog the spout. Instead of whiskey can I put cognac in it? BEST ANSWER: Yes, my husband has aged Texas whiskey, winter ales (craft beer), brandy and a cheap blanked scotch. It works great on most types of liquours. Yes, cognac would be perfect for the Mini Oak Whiskey Barrel! What do I need beside the barrell to make scotch? BEST ANSWER: You can lose a lot by evaporation especially if not sealed properly. We have only aged our liquours for about 1 - 1.5 months. We had some lose but not a lot. I received my 2L whiskey barrel yesterday; love it! But Christmas is 2 months away. The packaging contains warnings to not let it sit dry. Is 2 months too long to let it sit in a box? Will it damage the barrel? BEST ANSWER: What the instructions mean is once it has been cured do not let it get dry. There should be instructions on curing the barrel before it first use with liquor. There is no problem with letting it sit for a couple of months. When choosing what to personalize, does it always come with the text that is below the word "Robinson" regardless of the number of lines? Yes, "Brand Premium Barrel Aged Whiskey" comes standard on the barrel. Is it best to make the max. volume of whiskey in these barrels or does it not matter? In other words, if I buy a 5 liter do I necessarily have to make 5 liters at a time or can I make less with the same results? BEST ANSWER: The size of the barrel simply will allow you to hold that amount of the alcohol or other liquid you are looking to hold. It will not effect the chemical reaction whatsoever. It should be filled totally and corked to prevent air. Air can spoil the aging process. Where in the USA is this barrel made from? Do you think I can use this for aging (evaporating) balsamic vinegar? BEST ANSWER: Yes, you may use the Personalized Mini Oak Whiskey Barrel to age balsamic vinegar; there is no information as to where in the USA the barrel is made. Yes June, you can use this for aging balsamic vinegar. These barrels are made in Virgina. Thank you for your questions! How long can I age the Whiskey? I am looking to fill the barrel then store for 20 years for when I retire. It depends on the company and type of whiskey. Most high-end whiskeys have been aged for 10-20 years, one of the oldest whiskeys in the world aged for 70 years, so it all depends. What are the directions for curing the barrel for first use? If you have any further questions, please feel free to contact us at 800 356 8466. Thank you again. The complete instructions will come with your purchase. Can i put the brand name of a whiskey, like "JAMESON" for the first line? BEST ANSWER: Hello William, Please reach out at 800-356-8466 and our sales department will be able to assist you with any custom personalization needs. Thank you! On the Personalized Mini Oak Whiskey Barrel does it come with the stand or any cleaning supplies or information? BEST ANSWER: The Personalized Mini Oak Whiskey Barrel does come with a stand and we do offer cleaning supplies for the barrel, item # 336 04. I have an order for 13 barrels ..we just found these online..i would need these done and delivered by Dec 4th..is this possible. Do you have express shipping? Can Line 3 be something other than City, State? I am ordering this for my groomsmen and would like the like line 3 to read "Groomsman" rather than putting a City, State. BEST ANSWER: Yes you can customize Line 3 with any personalization you prefer, up to 34 characters. Great - thanks for the quick response! Is it possible to not have the word whiskey engraved? Not on this barrel but you can take a look at our Personalized Mini Oak Wine Barrel. That does not have the word Whiskey on it. If so, are there additional costs? I do not believe we do but you can try to order by following the international checkout options at checkout on our website. Can a Company logo be added to the front instead of lettering? BEST ANSWER: Thank you for your inquiry, this Oak Barrel can only be customized with the lettering as shown. We do carry similar products that can be personalized with a company logo, please reach out to our consultants at 800-356-8466 for more information. Can this barrel also be used for drinking water? We're considering ordering one to take primitive camping, and want something less glaring than an Igloo cooler. BEST ANSWER: Sure, why not? It might just taste like oak. Note, the barrel has to be "cured" first according to the instructions that are included with it. Can the standard lettering be changed? If I purchased one of these, I would be putting whisky in it, not whiskey and the people to whom I would serve it would notice the difference. The lettering is as shown. If you are going to put whiskey in it you definitely want to order the whiskey barrel. Can the barrel be purchased pre-charred? BEST ANSWER: No, sorry it is not available for purchase pre-charred. I am planning to purchase a custom whiskey barrel today for Christmas. My understanding from one of the reviews is that you won't replace if defective after 30 days. This would only give us 2 days to check it to see if it leaks (sounds like it happens often). Are you giving extended warrantys for Christmas gifts? Our Customer Service Department will always work with you on items that take longer than in stock items. Please give them a call if you have any further questions @ 1-800-648-6058. We let our barrels set empty too long and now they have dried out and the metal rings are loose and it will not hold liquid anymore. Is there a way to fix this? BEST ANSWER: You can try and cure the barrels and that will expand and usually seal the barrel. Do you have one that says bourbon that I can personalize? Hi, Do you deliver to Toronto or Calgary, Canada? How long would that take? What type of whiskey would be best to try in this first since it will change the flavor of it? BEST ANSWER: Thank you for your inquiry. 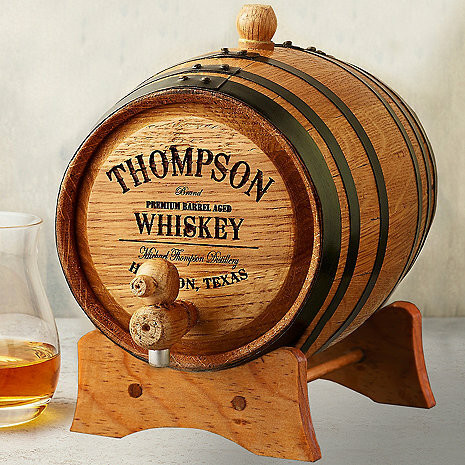 Any good whiskey would be perfect to start out the life of your new barrel! If you have any further questions, feel free to reach out to us at 800 356 8466. Thank you again. Great gift, but not high quality. Delivery took a couple of weeks. The products were packaged nicely without any damage. It should be known that customer service was extremely responsive and helpful and it is for this reason that I would recommend Wine Enthusiast. A word of caution however: there was a mix up with with my custom engraving and as a result I had to wait another 2-3 weeks for delivery of the correct engraving. It was an honest mistake and to their credit, customer service has done everything they can to fix the mistake. But unfortunately because of the delay, one of my groomsmen will have to go without a gift until after the wedding. If you order, just check and double check that everything is entered correctly. I would never attempt to put any kind of liquid in this thing. It looks like something made in a Boy Scout Craft Class. About the only thing it is good for is a decorative display on a shelf. When I received it, it had lots of small pieces of wood inside the cask. The 1 liter is just too small for the personalization option. I ended up buying the 3 liter. Read the size of the barrels before making the purchase. We bought the 5L barrel for my in-laws 30th anniversary, and they were MOST OVERJOYED by the gift! NO problems, as long as you FOLLOW DIRECTIONS for set up. The wood inside is from the charring process, of pieces that have broke loose.... NOT AN ISSUE, as it gives more surface area to work BETTER!! And, yes, more to order for Christmas this year!! The customer service was pitiful. I expect that when I pay this much money for a product that breaks due to no fault of my own, it should be replaced. A $50 store credit for future purchase is disappointing and useless, since I'll never order from this company again. My sister from Singapore really loves them. I was really worried that this was not going to get to me in time for my boyfriends birthday but at around 2 weeks after ordering it arrived in perfect condition! Everything was spelled correct and I think it is going to be the perfect gift for a guy who is hard to shop for! Why are we not all aging our own whisky? Maybe now we will be. I am excited to have the personlized whiskey barrel, but the engraving has burn marks that have shadows above all of the letters and looks very messy. When I asked WineEnthusiast about it they said it was unavoidable to have the shadow markings. I asked them why then the model photos do not show these burn markings and they did not address that. They just said the burn markings are unavoidable. So I suggested they show a photo of the barrel with the actual type of look and quality the customer will receive. The barrel itself is fine, the lettering just looks very messy. Overall I really like the barrel. The wood finish was blurry nice and the font looks great. The "distillery" font was a bit too small, to where you almost couldnt read it. The one thing that I'm very disappointed in is the stand for the barrel. I specifically ordered from this company because the stand in the photo looked finished and that it matched the barrel. Turns out, it's not finished at all and isn't even properly sanded. Was not happy with the stand at all and really encourage the company to change this. Very well made and beautifully engraved. I got the smaller of the two barrels and I regret that. It is tiny and I wish I could exchange for he larger one but it’s too late seeing as it’s personalized. Depending on how well the liquor comes out, I may purchase the larger barrel. The service department called me to confirm the spelling of all the names on the barrels, and delivery was very fast, way earlier than I expected, it was packaged very neatly and everything was in great shape. I originally bought this for my five groomsmen, and it was such a big hit, everyone loved it, so I got another one recently for a father's day gift. I ordered the 3L and the first one that came in looked great, all lettering was clear and easy to read, but after trying to cure it for 5 days, there was still a large amount of water leaking. Emailed customer service and they had a replacement order placed later that day. Second one arrived, lettering looked even better than the first one and sealed up fine. They didnt even make me deal with sending back the old one. Probably the easiest online product replacement I have ever dealt with. The packaging was barely adequate, I was concerned that it may have broken in transit. I was sure to repackage it better before wrapping it as a gift. Not sure about the negative comments. All was exactly how they described. No leaks, No issues with the bands and I am using it for whisky. yes the engraving was small but I only had a 1 liter. What would you expect? Prompt Delivery. Products arrive in prefect condition. Gave this to my father as a christmas gift and he loved it! Highly recommended. I felt obligated to write a review after hearing some of the 'bad' reviews of this product. My experience with the barrel has been absolutely 'as promised'. I'm not sure what other consumers were expecting with this purchase, but it's a BARREL, not some designer piece of oak furniture. One could argue that any bourbon/scotch worth buying in the first place probably doesn't need more time in an oak barrel, but so far i've tried Makers Mark, Woodford Reserve, and am considering a single malt scotch after the WR is done. It's an interesting product. It does everything a whiskey barrel should be expected to do. I bought this item as a gift for my sister and her family. They really enjoyed the personalization and quality. It is not used for spirits, it sits on the fireplace mantle, looking very cool. Love it. Wouldn’t change a thing. My wife bought this for me for Christmas. It is probably one of the best things I have ever been give. I am on my second week of improving regular Crown Royal. It has already improved it to XO. Ready to see what week 3 brings. Going to try Penalton Midnight on my next batch. Ordered this as a gift for a groomsman, not sure what to expect for quality and ability to use. I was amazed with the detail and quality of this piece. Came with great instructions on how to season for first use. I can't wait to see it in use at my friend's home bar! The stand is different than in the picture but it's still beautiful. Bought this as a gift, it was a hit! I bought this item to give as a gift so I didn't get the chance to use it, but everything beforehand was great. The mini cask looked great. The custom lettering was very well done. Everything was packaged neatly and came on time. It's the most reasonably priced mini cask on the net and what guy or girl doesn't want to flavor enhance their own whiskey? I bought this for my dad and he loved the look of it. We haven't tried to physically put any whiskey in it yet, so I can't comment as to how well the product "ages" the whiskey or if the spout works. The only disappointment I did have is that Line 2 allows you to personalize, BUT it adds "Distillery" to the end of what you type - nowhere in the description does it say this. With the 1Ltr size the font is really small so its hard to tell anyway. Overall, it makes a handsome addition to the bar. Didn't turn out the way I had expected. The product didn't turn out as expected. But Customer Service resolved my issue. Purchased as groomsman gift. Nice to have something personalized for my friends. This is very cute but had to reorder for the 5 L which was still smaller than I hoped for. I bought this for a valued client. The quality was acceptable. I purchased the smallest size. The writing is a bit small, especially the name. I'd order a size bigger next time. The build is slightly rough, but acceptable. It's a novelty. I'd order again. Shipping was prompt considering it was a custom item. The small hole from the lathe is no big deal. Ordered around christmas time. Came very fast but the product was very cheap looking when we opened it up. It looked like it was thrown together in minutes. It leaked and did not hold any liquid. Took me several phone calls and emails and had to provide pictures multiple times of the barrel in order to get a replacement. The replacement barrel looked like a completely different product. It was solid and sturdy. Have not had a problem with the barrel since. I would recommend this product to someone just make sure it is rock solid and you water test it prior to putting whiskey in it. What showed up is functional, but not nearly as nice as the picture. The picture looks like it has some finish on it, the product I received is unfinished wood. The engraving isn't nearly as nice as the picture. I'd probably order again, how ver the p cure is VERY misleading. We'll see how it works. I ordered it for a Christmas gift. The holes drilled left many bits and pieces; shards hanging around the rim. I'm not sure we can get those off or removed for or during the curing process. Also, the line where you can personalize a "distillery" is very faint and almost illegible. It's like it wasn't examined before exiting the warehouse. And dropped a few times before it made it into the box. The metal rings around the barrel are scuffed and snag your skin. I get the barrel is made from wood but I'm convinced I have a few splinters from examining it. Not a great first impression given the price for this item. Hopefully it will be more pleasing to the eye and palette. When purchasing this product I was super excited since my boyfriend's parents make their own wine and this seemed to be the perfect gift. I ordered the product three and a half weeks before Christmas and had not recived it by December 22nd. Worried I wouldn't get it in time, even though it was guaranteed, I contacted customer service and it was awful. She was rude and even started raising her voice in parts of the conversation - I couldn't believe it. Anyway, she told me the product had not even shipped yet and told me there was nothing she could do. Didn't offer any sort of help, and pretty much rushed me off the phone. Angry and still worried, I tried to contact the company through email and no response. No surprise. Funny thing is... When I got home that day, the barrell was sitting on my front porch! Man, UPS must have been SUPER quick that day since the lady had just told me 4 hours before, that it hadn't even shipped out of the warehouse that is located several states away from me. When I opened the box, I wasn't extremely pleased with what I saw, but it wasn't terrible. I ended up giving it as the gift and thankfully, his parents loved it. Bottom line, customer service is terrible, product is decent, and don't expect high quality from any aspect of this company. One of the whiskey barrels came broken. Has small leak and a small piece of wood inside. This was a gift, a personalized gift that I am going to have to return. The one gift I was most excited to receive has made me most upset. I am truly ashamed of this gift! Out of the box was this tiny, pathetic little barrel that I cannot imagine is functional. The personalization is barely legible. The spigot/bung is off kilter. The face of the barrel is roughly, jaggedly "carved" (aka chunks as if a child hacked at it) -some hang loose - and pieces of wood was left inside. In summary, CHEAP in appearance, but not cost. If I had a do-over, I would definitely NOT buy this. Lesson learned. I purchased this for a friend and his girlfriend for a housewarming gift as they just purchased a home together. When I arrived after a long flight to enjoy the festivities and they opened the gift in front of other people, I was embarrassed by the gift that I purchased for them. DEFINITELY not worth the money paid for it! I did not receive the stand for the barrel! I ordered this product right after Thanksgiving "guaranteed for Christmas. "A week before Christmas I got an email that it shipped and I was excited to have it in before the holiday. There was no yracking information. I didn't have it yet on the 23rd so I called and they couldn't give me a date or be much help. I didn't get it Christmas eve or day. I actually had to contact the company many times afterwards to get them to give me a tracking number. Guess what? It hadn't actually shipped yet! Two weeks afyer the holiday the gift came in which meant I had to buy the recipient another gift doubling the cost to me so he didn't leave Christmas giftless. My recipient was also from out of town so he left before this came in. Being personalized I can't give it to anyone else!